Nestled between Israel and Jordan is an ancient wonder that has healed and inspired humankind for thousands of years: The Dead Sea. The climate in the region is sunny and dry year-round, and the air is free of pollution. Visitors can soak up therapeutic sunlight with a reduced likelyhood of a sunburn, thanks to a unique UV filter caused by the Dead Sea's location and extremely low elevation. The water in the Dead Sea is rich with naturally occurring minerals known to soothe tired muscles, decrease inflammation, and promote healing. And, the salt content of the Dead Sea is so high that people float on the surface without even trying. It’s no wonder the Dead Sea is such a popular tourist destination and a center for healing and treatment! But you don’t need to go to the Dead Sea to reap its magnificent rewards. 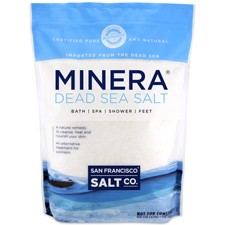 We offer authentic, natural Dead Sea salts for you to use in the comfort of your own bathtub. If you suffer from stress, anxiety, aches and pains, skin conditions like psoriasis, eczema, acne, or other conditions, Dead Sea Salts may provide relief! Our Dead Sea Guide is a resource for everything related to the Dead Sea and its therapeutic salt, including benefits, usage suggestions, research studies, interesting facts, history and more.